All these cities shared a number of common features being a part of the Roman empire: they all had populations that mixed Romans, Greeks, and Jewish populations as well, all the Christian groups in these cities were small minorities in a sea of polytheistic religious practices including the worship of the emperor who had to navigate life in a complex world where society and religion were closely intermingled, and all of these cities were dependent on their connection to Rome for trade and it was common for local leaders to attempt to pay tribute to Rome. Contrary to what many people would guess, worshipping of the Roman emperor as a ‘god’ or a ‘son of a god’ seems to have emerged not in Rome but in the provinces where local officials were attempting to demonstrate their loyalty and curry favor with the empire. Ephesus was a port city that relied upon trade. Artemis was one of the major deities worshipped in Ephesus and often being a part of a trade in the ancient world was associated with a temple. When Acts 19 relates the story of Paul being in Ephesus we can see the connection between the trade of the silversmiths, the temple of Artemis and the way in which Paul’s message was viewed not only as a different religious sect but a challenge to the economy of the city and was enough to cause a riot. 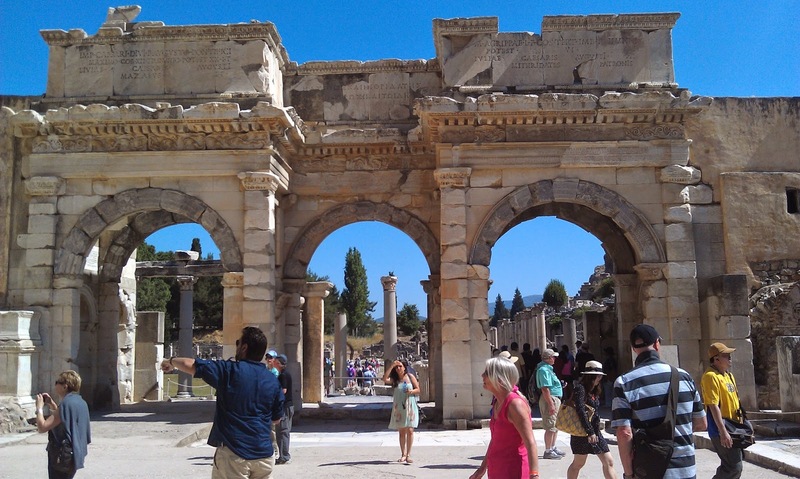 Ephesus was also a port where slaves were traded along with all other forms of commerce. In the introduction to the message of the church in Ephesus’ angel we are directed back to the image of Christ which John initially sees in Revelation 1, the seven stars and seven lampstands. The church in Ephesus is commended for its discernment between true and false apostles and their endurance in their allegiance to Jesus. Craig Koester suggests that where they have fallen is related to this: “the problem seems to be that their opposition to false teachers has led to a loss of love for other believers. Therefore, the Ephesians are called to do the work they did at first, which would have been acts of service for others.” (Koester, 2014, p. 269) This is one of the challenges Christians of many times have had to deal with. It is too common for communities that become rigid in their boundaries to become suspicious and hostile to outsiders, but Christian communities were to be communities of hospitality, service and love and yet remain true to their commitments to the gospel in a pluralistic world. They are called to repentance, to turn back to their first love and if they fail to repent they ultimately will fail to be church. The image of their lampstand being removed also means that the community has been symbolically removed. The Nicolaitans are mentioned for the first time here. We don’t know much about this group. It is often conjectured that they were willing to eat meat offered to idols, like some of the believers Paul addressed at Corinth (1 Corinthians 8). This educated guess makes sense in a world where meat was often available at festivals (in a world before refrigeration most times when you ate meat would be at festivals and almost every festival in the ancient world would have religious aspects). Ultimately the Nicolaitans probably advocated for a less distinctive Christianity where people could still partake in the public events and trade groups associated with local and Roman customs, authorities and powers. To John this level of accommodation betrays their allegiance to the one who holds the seven stars and seven lampstands. In the conclusion we have the first use of one of Revelation’s favored words: conquer (Greek nikao). This word has aspects of conquering in military, sporting and in the terms of remaining faithful and it will be important to watch how Revelation redefines this term in light of Christ victory (conquest). This Greek word is probably best known today in its use by the giant athletic shoe and clothing company and cultural icon Nike. Those in Ephesus are commended to conquer in light of Christ’s conquest which comes through love and steadfastness. If they conquer they are promised to eat from the tree of life which is mentioned in Genesis 3 and reappears in Revelation 22. The second message to the church in Smyrna is shorter and reflects a different situation for the church being addressed. The church in Smyrna is undergoing affliction and poverty yet their faith seems to be strong. Their steadfastness in this cultural has probably had an economic cost, but instead of storing up treasures on earth this community seems to have placed their riches in heaven where neither moth nor rust consume (Matthew 19-21). They have resisted assimilation into the ways of the empire and local culture. They may also be experiencing conflict with the Jewish community or Christians that have argued for retaining the practices of the Jewish law. As mentioned above trade in the ancient world was also linked with both religious and political practices that many early Christians may have found troubling. There was no separation of church and state like we can discuss in modern times. Successful merchants were expected to show patronage to both the civic projects which would pay homage to the Roman empire and to show their devotion to the appropriate deities for their trade. Christians and Jews both would have resisted this. Jews within the empire were known and had some level of protection for their practice. Within the Roman empire, with its emphasis on piety, security, concord and peace, there were many who were intrigued by a religion like Judaism with its focus on the law. As Christianity and Judaism begin to move farther apart in this period the early Christians probably lost the shelter of being known as a Jewish movement and may have encountered animosity from Jewish people not wanting to be associated with what was perceived as a heretical and dangerous movement. The term ‘synagogue of Satan’ sets up an opposition between the ‘congregation of the Lord.’ In Revelation’s time the conflict was fresh and the early Christians were a very small group within the empire. There probably was some sense of betrayal by those in the synagogues over their exclusion or perhaps even identification to authorities. Yet this term has an unfortunate history within the church. The church would in the span of two centuries move from being a small group sometimes actively persecuted within the empire and other times excluded from commerce and the broader society to an accepted and eventually the official religion of the empire. The church as a power within Roman and other societies would use this and other passages in the New Testament as justification for their later persecution of the Jewish people. The connection of the church and the synagogue would be lost only to be recently appreciated again. This message is one of encouragement for a community either enduring or about to endure hardship. John mentions imprisonment as a part of the suffering they will endure and to remain faithful until death. In documents shortly after Revelation’s composition we start to see the early church writing about early martyrs like Polycarp, Perpetua, Felicity, Ptolemaeus and many others. Their steadfast witness would become an important illustration of the content of their hope. Those who conquer will be given the crown of life, and perhaps they will see themselves among the elders casting their crowns before the throne. The resurrection was central to the hope of the early church and the witness of those willing to be faithful unto death gave a new meaning to the word which is translated as witness (martyr). In light of the militaristic images throughout much of Revelation we see now the church in Smyrna addressed like soldiers going into battle, and yet their conquering will not be through taking other lives but in the willingness to give up their own on the model of Christ. 13 “I know where you are living, where Satan’s throne is. Yet you are holding fast to my name, and you did not deny your faith in me even in the days of Antipas my witness, my faithful one, who was killed among you, where Satan lives. 14 But I have a few things against you: you have some there who hold to the teaching of Balaam, who taught Balak to put a stumbling block before the people of Israel, so that they would eat food sacrificed to idols and practice fornication. 15 So you also have some who hold to the teaching of the Nicolaitans. 16 Repent then. If not, I will come to you soon and make war against them with the sword of my mouth. 17 Let anyone who has an ear listen to what the Spirit is saying to the -churches. To everyone who conquers I will give some of the hidden manna, and I will give a white stone, and on the white stone is written a new name that no one knows except the one who receives it. The third message is addressed to the church in Pergamum and it has a two-sided message of encouragement and repentance. They are living in a culture that is opposed to the Lordship of Christ and in Antipas we see evidence of the only person in these messages who has been killed for his faith at this point. In a culture that called for them to assimilate to the practices of the community around them and to pay homage to the emperor the early Christians found themselves labeled as atheist and disturbers of the peace. 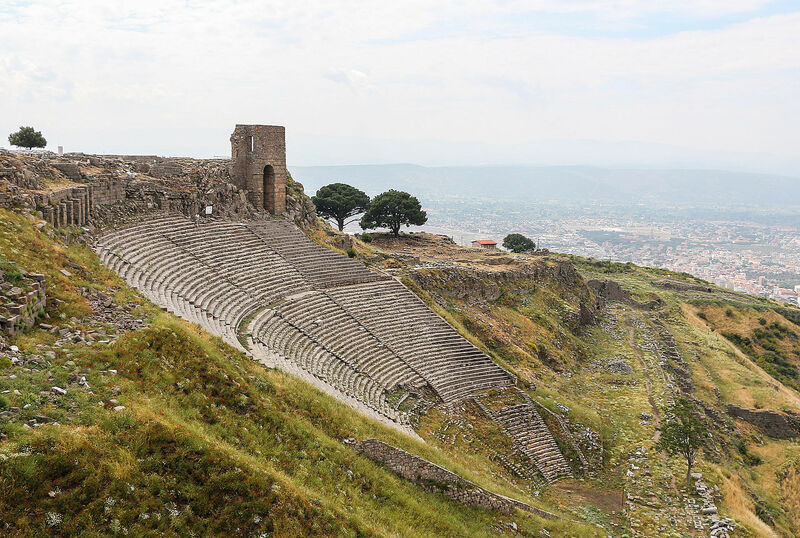 Pergamum was a city where the imperial cult was a source of pride. As mentioned above the worship of Caesar as a god was practiced more commonly throughout the provinces as a way of showing their piety, devotion and to curry favor with Rome. They established the first provincial temple dedicated to Augustus and the goddess of Rome after receiving permission to establish a sacred precinct to Augustus in 29 BCE (Koester, 2014, p. 284). Rome’s economic and military power became enshrined as a civil religion where the emperor and the might of Rome was lifted up, honored and worshipped. The early Christians would have met strong resistance in Pergamum for their unwillingness to participate in the civic religious festivals and honors. Yet, in the midst of this there are apparently some in the community who are trying to find a way to remain connected to the society and a part of the church. There would have been strong pressure to accommodate with the culture in both eating and participating in some of these rituals. The reference to the stories of Balak and Balaam from Numbers 22-25 may have indicated some Jewish background for this community or at least familiarity with this story from the people of Israel’s approach to the promised land. Balaam is commissioned by King Balak of Moab to curse the people of Israel as they moved toward Moab but, after the incident with a talking donkey saving Balaam from the angel of the LORD, Balaam extends three blessings to Israel. Yet, the people of Israel at Shittim begin to have sexual relations with the women of Moab and are invited to participate in the worship of other gods and this kindles the LORD’s anger at this infidelity to God’s calling of them as the LORD’s chosen people who are to have no other gods. John uses this story to chastise those who he feels have been unfaithful to their calling by participating in these practices. The Nicolaitans are mentioned in connection with this and probably are willing to take part in these festivals and eat the food offered there. John wants those in the congregation participating in this that they have aligned themselves with the forces opposed to God and that Christ will be making war against these forces. Fornication in scripture does not always mean sexual immorality. Most frequently this term is used metaphorically to refer to idolatry (ex. Hosea 1,2, Jeremiah 3,). It can also refer to participating in commercial activities that were viewed as unfaithful (and this is a common use in Revelation). Sometimes fornication is literally fornication but frequently in the prophets and Revelation it is a metaphorical unfaithfulness through idolatrous and commercial practices. To those who conquer there is the promise of manna and a white stone with a new name on it. Manna is the bread that the LORD fed the Israelites with in the journey in the wilderness from Egypt to the promised land (Exodus 16: 4-8). The white stone could have a couple of meanings in the society: indicating a positive vote, a token of admission or as a stone of protection like in an amulet. I find the idea of the positive vote most likely since voting in the ancient world was often done by placing a small stone in an urn and typically a white stone was a positive vote while a black stone was a negative vote. The name on the stone is probably the name of Christ but could be a new name given to the individual believer as a sign of their new identity. 19 “I know your works — your love, faith, service, and patient endurance. I know that your last works are greater than the first. 20 But I have this against you: you tolerate that woman Jezebel, who calls herself a prophet and is teaching and beguiling my servants to practice fornication and to eat food sacrificed to idols. 21 I gave her time to repent, but she refuses to repent of her fornication. 22 Beware, I am throwing her on a bed, and those who commit adultery with her I am throwing into great distress, unless they repent of her doings; 23 and I will strike her children dead. And all the churches will know that I am the one who searches minds and hearts, and I will give to each of you as your works deserve. 24 But to the rest of you in Thyatira, who do not hold this teaching, who have not learned what some call ‘the deep things of Satan,’ to you I say, I do not lay on you any other burden; 25 only hold fast to what you have until I come. 26 To everyone who conquers and continues to do my works to the end, I will give authority over the nations; 27 to rule them with an iron rod, as when clay pots are shattered — 28 even as I also received authority from my Father. To the one who conquers I will also give the morning star. 29 Let anyone who has an ear listen to what the Spirit is saying to the churches. The message to the church of Thyatira is predominantly addressed to a faction within the church associated with a woman named Jezebel here. The community is growing in their practices of faithfulness, hospitality, service and endurance with exception to this group and for those who have not associated with this group the are only called to hold fast. Jezebel is a reference to the wife of King Ahab, daughter of King Ethbaal of the Sidonians who is in direct opposition to the prophet Elijah and along with King Ahab turns Israel away from worshipping the LORD the God of Israel to worshipping Baal (I Kings 16: 30-22:40). John and this woman apparently had struggled for authority in the church and John had probably used the language of Jezebel to name her in previous incidents. The woman titled Jezebel was probably a resident member of the congregation and so that provided an additional challenge for John who was not. As mentioned above the fornication is probably a metaphorical use of the term where her followers participated in the society’s religious and commercial practices in a way that John deemed idolatrous and unfaithful. The ‘deep things of Satan’ is probably a parody of the ‘deep things of God’ where some group claims to have some deeper knowledge of God’s will or intention. As in Daniel 2:22 where God reveals the deep and hidden things or 1 Corinthians 2: 10 where the Spirit searches even the depths of God, there may have been some claim made by this group of some deeper knowledge of God’s will that John denies. In language that parallels Jeremiah 17:10, John now sets this group apart as one under God’s judgment for their deeds. The community that conquers is now to rule alongside Christ. They will also receive the promised ruler, the morning star, who is Christ. This is also the only use of Son of God in Revelation, although Jesus will refer to God as Father, and the community who will eventually receive the morning star and Son of God cannot extend those titles to anyone else. In a society where Caesar was lifted up as a son of a god this exclusive claim that the early Christians made in their society had political consequences. Yet, they look forward to a time when the world is reversed and the faithful ones rule the nation rather than those Revelation will later label as monstrous. This entry was posted in Biblical Reflections, Revelation and tagged book of Revelation, Ephesus, John the Seer, Pregamum, Revelation, Revelation 2, Smyrna, Thyratira. Bookmark the permalink.